A gun collector purchased a USMC-stamped M1911 .45 caliber pistol in an on-line auction. The gun was a bit knocked about, and it had been re-blued, diminishing its value. He got a good price on it. So, as mentioned previously, SNO and I managed to clear bores on the .22 LR semi-auto and as well as the Remington 742 ** .30-06 (which if you haven’t shot one of those in an enclosed range recently, wear double hearing protection). The Sig we gave a pass on this time, for economic purposes. For you see, a range-bought block of 20 .30-06 shells sold for a shade over $30, while $21 purchased 525 .22LR rounds. Re-sighting the Remington was perforce quick work at those prices, but the .22 rounds lasted forever. After shooting the .22 rifle until the receiver got hot, we rented the range’s Beretta .22 Neo – a fun little plinking gun – for another good hour of target practice, including some tactical drills. And having actually gotten tired of shooting before we ran out of ammunition, we left satisfied and with over 300 rounds left to shoot next time. It seems to me that an inexpensive little pistol like that – or a Ruger .22 – would be a dern good way to practice fundamentals and accuracy, saving the working gun for familiarity rounds and jam drills only. But you guys probably knew that already. ** 07-29-2018 Original link gone; replacement found – Ed. I don’t own any handguns, being more of a hunter than a shooter – although these, days, eh: Not so much. Limited access and noli me tangere quia Caesaris sum, etc. I do enjoy poppin’ me some caps though, so when SNO encouraged me to go with him down to the local, it was with no great reluctance that I accepted. We had intended to get even with some clay pigeons, but the Miramar range * didn’t have the good grace to be open on the Second of January in the Year of Our Lord, 2007 so we defaulted to the indoor range and pistols at 10, 15 and 20 paces. After two decades of use, the U.S. Department of Defense is getting rid of its Beretta M9 9mm pistol, and going back to the 11.4mm (.45 caliber) weapon. There have been constant complaints about the lesser (compared to the .45) hitting power of the 9mm. And in the last few years, SOCOM (Special Operations Command) and the marines have officially adopted .45 caliber pistols as “official alternatives” to the M9 Beretta. But now SOCOM has been given the task of finding a design that will be suitable as the JCP (Joint Combat Pistol). Various designs are being evaluated, but all must be .45 caliber and have a eight round magazine (at least), and high capacity mags holding up to 15. The new .45 will also have a rail up top for attachments, and be able to take a silencer. Length must be no more than 9.65 inches, and width no more than 1.53 inches. You hit something with a pistol? It’s close. You want it to stay hit. I know which one I’d want, if it was up to me. Several years ago Suburban Auto Group released a series of “Trunk Monkey” commercials. 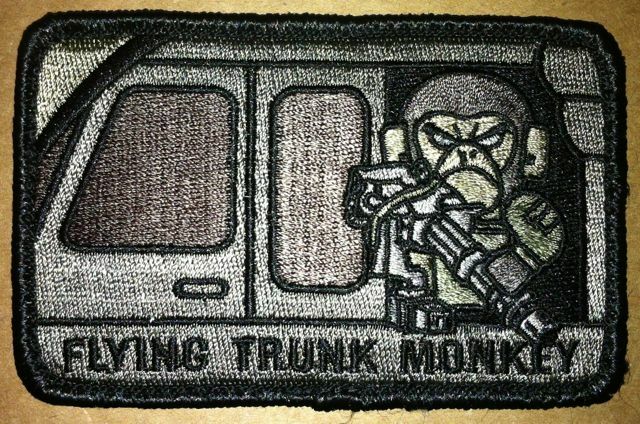 Somehow this struck a chord with the crew chief and gunner community in Army Aviation, who promptly joined the ranks of Flying Trunk Monkeys. What can I say, I like that chimps attitude. Being a Blackhawk crew chief covers a lot of territory besides flying. We spend a lot of time doing inspections and maintaining the helicopters, not to mention training. Training varies from mind-numbingly-boring-required-by-someone-or-other-and-having-nothing-to-do-with-anything to “Oh, yeah… They pay me me to do this!” Gunnery training generally falls into the later category. I put together a little clip of about 800 rounds worth of the fun for your viewing pleasure, including a brief view of what a passenger at night sees. I’m going sinker once again, so for the next week Mongo will be at the controls. Originally posted June 10th, 2006…with a nod to Kris in New England.